In 1774, at the age of 28, having already made a name for himself in his native Zaragoza and traveled throughout Italy, Francisco Goya moved to Madrid at the invitation of German painter Anton Raphael Mengs. There he would spend the next five years working mainly for the Royal Tapestry Factory, producing huge sketches, or cartoons: preliminary paintings for tapestries that would hang on the walls of two royal residences, the Escorial monastery and the Pardo palace. Goya would continue working with the Royal Tapestry Factory on and off for the next two decades, producing around 63 cartoons at the same time as establishing his position as painter to the Spanish court. Taking advantage of refurbishment work in the second-floor galleries of the Prado Museum’s south wing that house Goya’s cartoons and part of its collection of 18th-century Spanish paintings, the Prado has organized Goya in Madrid, an exhibition of the cartoons scheduled to run in its temporary exhibition galleries until May 3. Miguel Zugaza, the Prado’s director, says the exhibition shows the cartoons as works of art: “These are not simply templates for tapestries, but complex masterpieces in their own right,” he says. The exhibition’s curators, Manuela Mena and Gudrun Maurer, have brought together the series – which is not complete: El pelele (The straw mannequin) and El alabañil (The laborer) are on loan – across 15 rooms. The works explore a number of themes: hunting, dreams, the four seasons, music and dance, childhood, and the open air, which is underscored in the final gallery by a background recording of the wind. 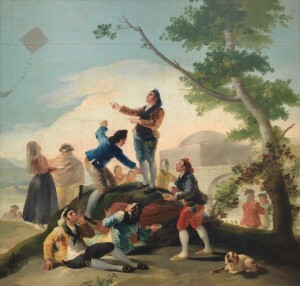 The freshness, realism, and imagination of Goya’s work is illustrated by the inclusion in the exhibition of pieces by his contemporaries at the Royal Tapestry Factory, including Mariano Salvador Maella, Luis Paret, Matías Téllez, and the Bayeu brothers, Francisco and Ramón, to whose sister, Josefa, Goya was married. The exhibition also highlights some of the influences Goya took from the great masters. The use of mythological figures in La gallina ciega (The blind hen) from 1778 draws on Rubens’ Dance of Italian Villagers, which is placed next to it, while the posture of the figure in the foreground of Partida de caza (The hunt begins) from 1775, has echoes of Jacques Saly’s 1751 sculptureFaun Holding a Goat. Goya’s figure of a young man smoking in El juego de pelota a pala (Bat and ball game) was possibly inspired by one of Michelangelo’s portraits of Lorenzo de Medici, says Mena.